By Ann-Marie Towers, Senior Research Fellow and ASCOT programme lead. 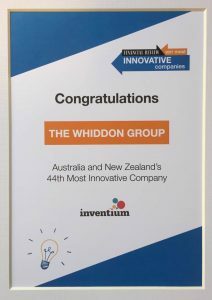 The Whiddon Group in New South Wales, Australia, have been rated 44th on the 2017 Australian Financial Reviews’ Top 50 most innovative Australian and New Zealand companies, following their work with the ASCOT team and the University of Kent. In 2015, we embarked on a research and enterprise project with the Whiddon Group of New South Wales, Australia, to explore how they might use the Adult Social Care Outcomes Toolkit (ASCOT) to inform care planning conversations with residents in their aged care services. Whiddon have 18 residential aged care facilities across New South Wales, each offering nursing, health care and dementia care services, they also provide care to older people living in their own homes. As part of a relationship-centred model of care, Whiddon were keen to explore how they might better focus care planning and practice on the well-being of residents. Working with four pilot sites, we adapted the ASCOT so it could be completed as part of a Circle of Care conversation. These conversations involved the resident, their family members and their dedicated care worker and were led by a Registered Nurse, who had received training from the ASCOT team. ASCOT measures care-related quality of life across eight domains (see box below) and can also be used to estimate the impact a service is having on those outcomes. Residents and their families responded well to the ASCOT domains and the questions opened up conversations about aspects of their lives that staff felt would otherwise have been missed. Indeed, in one site, a whole service issue around meals was identified because of the focus of the ASCOT questions. The care planning meetings lasted no longer than usual but successfully refocused the attention on well-being. Staff reported having a better understanding of how they they could better support residents social and emotional needs with more tailored and personalised care. “Through this innovative and sustainable approach, Whiddon has enabled our care teams to hold the right conversations with residents as part of their individualised care planning to help support and measure wellbeing outcomes. As a result, we’ve seen a significant increase in residents’ quality of life.” (Chris Mamarelis, CEO, Whiddon Group). The pilot study is due to be published early 2018 in the Australian Journal of Dementia Care. Interim results were presented at the Better Practice Conferences (run by the Australian Aged Care Quality Agency) in 2016, and at the Australian Association of Gerontology (AAG) in Canberra in November 2016.